When Judy was admitted to the Hospice, her three daughters were nervous and emotional. They didn't know what to expect. But they knew they wanted the very best care for their beloved mum. After months of caring for Judy at home, Carolyn, Prue and Erica were pleasantly surprised. To have a team of dedicated staff caring for their mum meant that they could focus on being daughters, not carers. Carolyn, Prue and Erica felt immediately at ease. 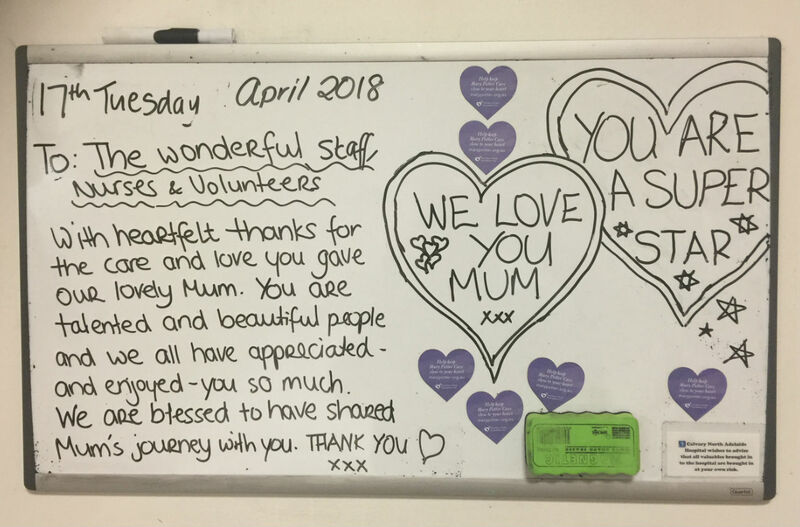 In the weeks that followed, they got to know the staff and volunteers in the Hospice. The staff recognised that the sisters were exhausted. The idea of a ‘spa day’ was suggested as a way of supporting the family through this time. It was decided that this special day would be a surprise for Judy. On the day, a trolley with champagne, fruit, sandwiches and chocolates was wheeled into Judy's room. The trolley was followed by Rose, the lovely skin therapist from our complementary therapy program. There was music and aromatherapy. A sense of calm. Judy had a pedicure and manicure. She was so happy to have a glass of champagne in hand and her three loving daughters around her. One by one, they headed to Hospice Retreat Room for a 45 minute relaxing massage. Rose told the ladies that it was safe to release emotions in this sacred place. Carolyn, Prue and Erica were able to let down their guard and acknowledge how heartbreaking it was to know they were losing their mum. There was no brave face needed. They shed some tears, let go of tension and started to relax through Rose’s soothing touch. This day turned out to be Judy's last ‘best day’. A happy memory that sustained the three daughters and gave them what they needed to face what was to come. On the day that Judy died, this family wrote a beautiful note on the whiteboard in her room. There was true joy in their message. You made these moments possible for this family. Your support ensures that Mary Potter Care is available for families just like Judy and her daughters. You gave them a truly unexpected gift and we know they will draw strength from their memories, particularly when they are having a difficult day in the months ahead. Thank you.